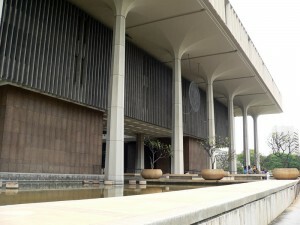 The House of Representatives today announced that the House Chamber will be open daily for Hawaii State Capitol visitors and guests to tour the gallery area during the remainder of the month of February as a pilot project. After February, the project will be evaluated and a decision will be made on whether to extend access to the Chamber year round beyond the months the legislature is in session, January to May. Access to the Chamber will be available from 9 a.m. to 3 p.m., including the hours that the House is normally in session. There will not be an official tour, however visitors to the Chamber will have access to look around, take pictures, and will be given a brochure explaining the history and symbolism of the Chamber architecture and design. The House Sergeant-at-Arms expects about 100 visitors to the Chamber daily. For more information, visitors to the islands and Hawaii residents should call the House of Representative’s Sergeant-at-Arms Office at (808) 586-6500.